I am honored to have two paintings included in “The Russell” auction to benefit the C.M. Russell Museum this year. 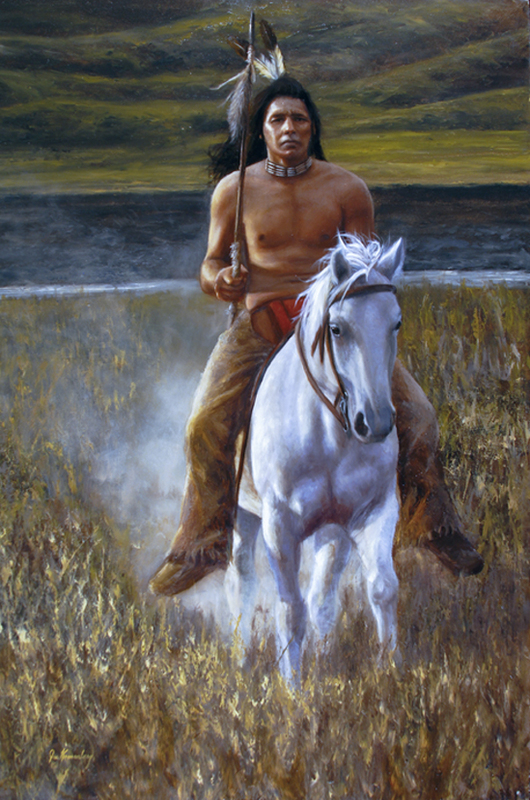 “Defender of the Plains” will be in the silent auction Thursday, March 20th at the C.M. Russell Museum and “Coup Run” will be in the live auction March 22nd at the Mansfield Convention Center, both in Great Falls, MT. I will also be participating in the “Art in Action” quick finish event at the Great Falls Country Club on the 21st, where some of the country’s top western and wildlife artists will complete a painting on site and then immediately they will be auctioned to raise money for the museum. And, just in case I don’t have enough to do, I will also have an exhibit room of my own (Room 280) in the Western Masters Show and Sale at the Best Western Heritage Inn, Great Falls, MT, the 19th through the 22nd. I’ll have many new works available to view and purchase. If you have not been to Great Falls the third week of March for the Charlie Russell events, it is one of the most unique art experiences in the art world. Hundreds of artists from all over the country display and sell their work at numerous shows located all over town. A rare opportunity to not only see great art, but meet the artists in person. I’ll post images as we get closer to the event. If you will be in Great Falls please stop by and say hello.